a swiss knife tool includes several functionalities for MaYa animators. AutoSnappableTimeLineSlider: Mimics smooth step navigation for Timeslider on snap mode. thus allows smooth navigation +allows keying integer times. 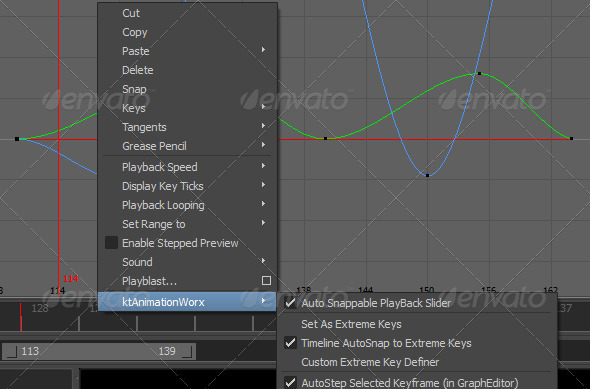 Autostep Selected Keyframe : TimeSlider automatically steps to time as you select a keyframe in graph editor. Define and Snap to Extreme Keys: allows an animation curve keys as Extreme keys and allows only snap to nearest TimeSteps. This allows to keyframe on other animating objects for only defined extreme key times.